This island is located halfway between the islands of Ko Samui and Koh Tao. This island is famous and notorious for the monthly Full Moon Party. Tourism started on this island in the 80’s. Mostly by backpackers who wanted an alternative for the more touristic island of Koh Samui. Facilities like roads, tap water, and electricity where scarce ate these days. The numbers of tourist visiting the island were not exceeding a few hundred. Nowadays tourism at Koh Phangan is booming with thousands of visitors. There are two main tourist areas on Koh Phangan. Thong Sala on the west side of the islands where the ferry boats will arrive. And the Haad Rin in the south of the island where the full moon parties are held. In both places are many hotels and guest-houses. There are also a few other beach towns in the northern part of the island, such as Malibu Beach, Bottle Beach and Thong Nai Pan Noi Beach. They are smaller and much more quiet. Despite the reputation as a noisy party island for young backpackers, couples or families will find a relaxed island atmosphere in these smaller places. The island can be reached by ferry from Surat Thani city. The Don Sak Pier is approximately 90 min driving from Surat Thani airport. Also island hopping by (speed)boat from one of the surrounding islands is an option. Boats departing from Chumphon will usually first stop at Koh Tao and then continue to Koh Phangan. Unlike on Koh Samui, there is no airport on Koh Phangan. 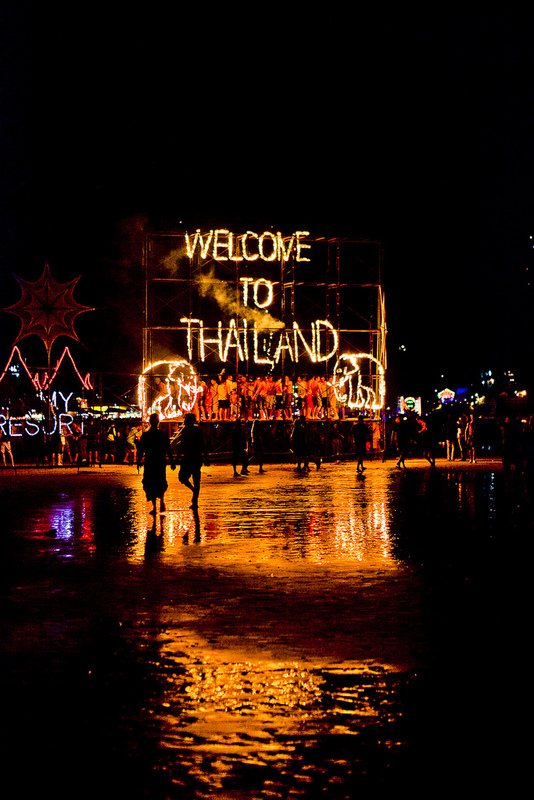 Since 1985 there is a monthly party which attracts revellers from all over Thailand and the rest of the world. People often dress up in bright coloured T-shirts and paint their face with illuminating paint. Alcohol is often served in small buckets with straws. The location of this party is Haad Rin beach in the south eastern tip of the island. Boats from neighbouring Koh Samui will drop of guests on the south west beach from where they can walk through Haad Rin town to reach the party at the north east beach side. Beside the noisy and crowded Full Moon Party (only at the small south eastern corner of the island) the island also has very quiet parts where you can experience the tropical island vibe. Another beautiful destination are the nearby islands of the Ang Thong National Marine Park which can be visited with boat trips from Koh Phangan. Full moon party on Wikipeadia.